For the ultimate getaway in Houston’s Bay Area, look no further than the South Shore Harbour Resort & Conference Center. 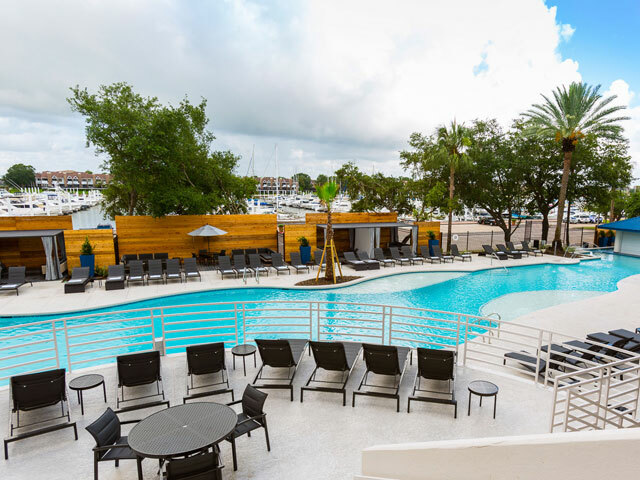 Overlooking a scenic marina, the resort offers luxurious accommodations, high-end dining, and a convenient location just minutes away from some of Houston’s most popular attractions. Catch the sunrise from your private balcony, welcome the warmth of the afternoon while you relax in the outdoor swimming pool, and end the day with a meal prepared by a world-renowned chef. Equally suitable for romantic weekend retreats and family getaways, South Shore Harbour Resort has something for everyone. Find out more about the resort’s dining options, fitness center, and amenities below. As a guest at South Shore Harbour Resort, you can savor fresh meals prepared with locally sourced ingredients without ever having to leave your home away from home. For breakfast, brunch, and lunch, order something delicious from the no-fuss menu at Paradise Reef Restaurant. Don’t miss the always popular Sunday brunch buffet or any of the special events including Easter, Mother’s Day, and Thanksgiving. Dinner is served at the Lighthouse Bar & Bistro, where Executive Chef Roland Kyburz crafts magnificent dishes that utilize local seafood and steak. While there is plenty of high-end dining at South Shore Harbour Resort, that’s not all there is to enjoy. Visit (or swim up to) the Pool Bar, where you can nurse a cocktail and munch on something tasty from the seasonal menu. If you’ve had a long day exploring Houston’s Bay Area and would rather stay in and unwind, take advantage of the hotel’s room service that is available for breakfast, lunch, and dinner. Regardless of what you’re craving or the type of dining experience you prefer, you’ll find it all at South Shore Harbour Resort. It’s not unusual for a resort to have a fitness center, but the one you’ll have access to during your stay at South Shore Harbour is on another level. The state of the art 130,000-square-foot facility is full of the latest and greatest equipment ranging from ellipticals and treadmills that face the harbor to kettlebells and weight machines. Step outside and you’ll find a lap swimming pool, a running track, and tennis courts (additional fee applies). Follow your workout up with some time unwinding in the spa before getting a light lunch at the on-site bistro. Whether you’re looking to get an intense workout in or you want to relax, The Fitness Center at South Shore Harbour is for you. *Only available on certain room types.